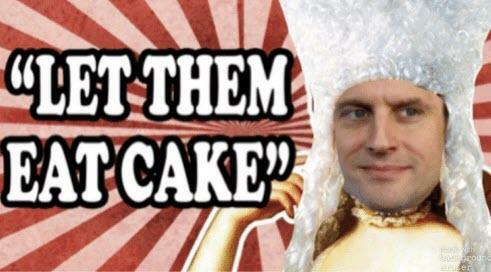 Is This Macron's "Let Them Eat Cake" Moment? While the so-called “yellow vests movement” has drawn a few hundred thousand people to sometimes violent protests and road blockades against high taxes on diesel, leading to two deaths and more than 500 people injured, French President Macron is travelling Europe, pontificating about things like an EU army. The protests bear a resemblance to Brexit: ordinary people have had enough, even if it isn't always clear of what and even if they have been voting for the parties responsible for high taxation. However, to dismiss their anger and to double down on policies to tax diesel, as Macron seems to do, may be very risky. Former US President Ronald Reagan once described what, according to him, was typically a government’s view of the economy: “If it moves, tax it. If it keeps moving, regulate it. And if it stops moving, subsidize it.” With diesel, the cycle started with subsidies. Between 1995 and 2015, the share of diesel cars on European roads doubled to around 50 per cent. Without government support for diesel-fulled cars, which were thought to emit less CO2 than their petrol counterparts, researchers have concluded the share would have remained constant around 25 per cent. Now that we’ve arrived in the taxation stage, which has pushed up prices by 23 percent in France over the last year, Macron is feeling the heat. Some 77 per cent of French people now support the yellow vests movement, and the number is rising. Even among Macron’s own voters, support stands at 41 percent. Some of the leaders of former President Hollande’s party are also on the street, despite being the ones who came up with some of the taxes that are being contested. The centre-Right and hard-Left opposition have also united against Macron to express support. The French socialist party has accused Macron’s government of trying to link this grassroots movement to the far right Marine Le Pen “to better disqualify it”. But according to sociologist Vincent Tiberj, the yellow vests movement derives largely from the lower-middle classes, who earn enough to pay taxes but not enough to live comfortably. A lot of the protesters come from “La France profonde”: small towns and rural areas that have often gone through dire economic times, far away from the world of Emmanuel Macron, a former investment banker. Macron himself has reacted by saying his government intended to “tax fossil fuels more” as a way to “support the poor”. Unfortunately for him, it seems the poor are not so keen on the method. A poll reveals that 82 per cent of French think the government should simply scrap the increase in fuel taxes foreseen for January. Macron’s popularity meanwhile continues to tank, from a 29 per cent satisfaction rate in October to 25 per cent just one month later. One in three French do not have an alternative to driving to work and cars are essential not only for economic but also for social reasons, preventing social isolation of the more vulnerable. For many people, this is not something to mess around with. Is this Macron’s “let them eat cake” moment? The phrase, attributed to Marie Antoinette, the last Queen of France before the French Revolution, was apparently uttered by her after she learned that the people were suffering due to widespread bread shortages. Suggesting that the ever higher fuel taxes are necessary for the environment may have the same effect on many of the “yellow vests”. Even if these taxes are needed to save the environment, many may wonder why then people were encouraged to buy diesel-fueled cars in the first place. They may also wonder why then only 184 million from the 3.9 billion euro extra income from the so-called “domestic consumption tax on energy products” raised this year will be used to finance the “energy transition” and why the rest will be used to help cover France’s extensive budget deficit. That’s especially the case as these taxes hit the less well-off harder, due to the fact that they tend to use older vehicles. Of course, if France weren’t the country currently leading the global ranking of government spending to GDP, people may be more relaxed about an extra 50 euro per month to fill up their tank to save the environment. But France’s “tax freedom day”– when people start working for themselves - only comes on July 27. Then the French government seems more keen on new taxes than on spending cuts. New taxation initiatives meanwhile include tax hikes for health care providers – a baffling 40% for 2019 -, on garbage collection and tourist accommodation. How will this not hit ordinary people? 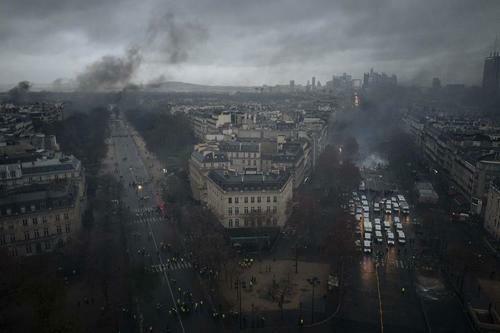 If a completely spontaneous yellow vests movement can already hit the revenues of big French supermarkets with 55 per cent in one day, one should wonder what will happen if the protestors start organizing themselves properly.